In English history the years between 1714 and 1760 are peculiar in two ways. They have received only scant attention from historians, and they witnessed the exclusion of the tory sector of the nation's landed elite from all central as well as from prime local offices. 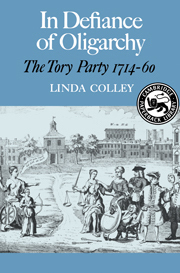 In this book Linda Colley explores the fate of the tory party which has dominated both Parliament and the constituencies throughout of the reigns of William III and Anne. She refutes any simple identification of the party with cryto-Jacobitism, and explains both the ideological, electoral, and organisational factors which enabled it to survive under the early Hanoverians, and the circumstances which prevented it from regaining total or limited access to the political centre. Like canaries down a mine, the proscribed tories are also used to gauge the atmosphere of their high-and low-political environment. By examining the tory party's persistent if unavailing parliamentary lobbies and opinion, Dr Colley brings into question many of the current orthodoxies about England's political stability under George I and George II, and casts doubt on the repidity and novelty of political and social developments thereafter.